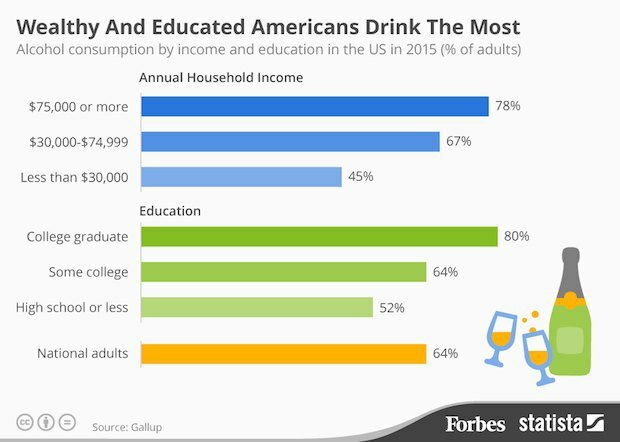 Wealthy and well educated Americans drink more alcohol than do Americans with less money and less education, according to a recent Gallup poll. Overall, 64% of adults drink alcohol. Fifty-two percent of those with a high school diploma or less said they drink, while 80% of college graduates said they drink. And 78% of people who earn $75,000 or more drink, compared to 45% of those who make $30,000 or less. This could be because wealthy people are more likely to participate in activities that involve drinking like eating out, going on vacation, and socializing with colleagues. Either way, we were most surprised by the finding that only 64% of adults say they generally drink alcohol. Maybe we've just never met the other 36%.